Vincenzo's has been on my priority list to of pizzerias to get to for a while now because of a recommendation I continue to get from a friend who swears by it. Finally, the day came, I kidnapped her and requested she navigate me to her holy grail of pizza and food. Upon arrival, I could immediately see why she would like the place. It is big, comfortable, relaxed, and most importantly very clean (including the bathrooms). They also have my favorite feature in a pizzeria - an open kitchen where you can see the pies being made. Before I get into my pizza experience, I must note that management must run a tight ship because of the professionalism and courtesy of the staff. This really started earning Vincenzo's brownie points before the pizza was even served. We placed an order for a small New York Style pizza, but to our surprise, the friendly waitress came over and notified us that we would be getting a bonus medium pie at no additional charge which meant that this pizza critic would be having lunch for the next day! When the pie was brought to our table, I had to pause a minute and just admire the work of art which was presented before me. It was evident that this pizza maker was a true pro. The pizza was a perfect sphere, cut into 8 equal slices that looked as if a protractor and a laser beam was used, my favorite shaped crust around the outside, which I refer to as "cutting edge." See close up pic and you'll see what I mean. So kudos to the pizza guy on a job well done. So now that I'm done "jobbing out" to the artisan in the kitchen, on the the review. 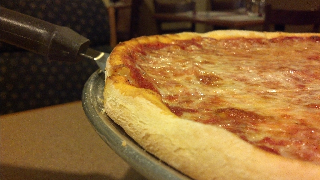 Upon first bite, it is clear that the cheese is a nice quality mozzarella which makes the whole pizza. It had great flavor, so good that on my second slice I just pulled off a gob of cheese and ate it by itself. The sauce is simple, yet flavorful, and works well with the cheese. It's differs slightly from a traditional NY pie because it contains hint of basil, which I'm not crazy about but can appreciate. The basil sets this pie apart from others, and that's what I seek to find. If you've ever had Dino and Francesco's in Clarks Summit, that's the most similar comparison I can draw. There was not a ton of sauce on the pizza, but there was a ton of flavor. Usually I like more saucy pie, but in this instant I was not left wanting more. Finally, the crust was just the right amount of crispy and chewy. I could tell that the dough was aged a bit as there were no bubbles and it was ever so slightly tough, but I tend to like it that way. Vincenzo's also offers a square pizza and several gourmet offerings which I'm sure are very good without even trying them. I would recommend this establishment for almost any dining occasion from a quick lunch to a big family dinner to a quiet night out. It seems to be one of those places that is good for just about any occasion. 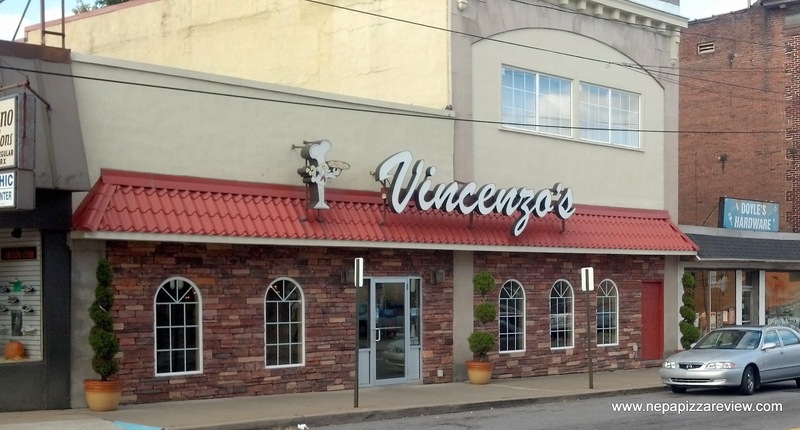 THE BOTTOM LINE: Vincenzo's has received one of, if not my highest ratings yet. Perhaps I was wowed by the appearance of the place and the craftsmanship of the pizza, but I felt the quality ingredients and brilliant execution provided a great pie which offers something just a little bit different. Vincenzo's is great pizza. Our goto favorite for parties lately. Family from out of town went bonkers for the hot wing, never heard of it. Never heard of Hot Wing? Wow, another concept I take for granted. It's been a staple in this area for at least 10 years! Well, at least we get something here in NEPA before the rest of the world does...anyway, as you can see above, I was very impressed with Vincenzo's pizza as well. 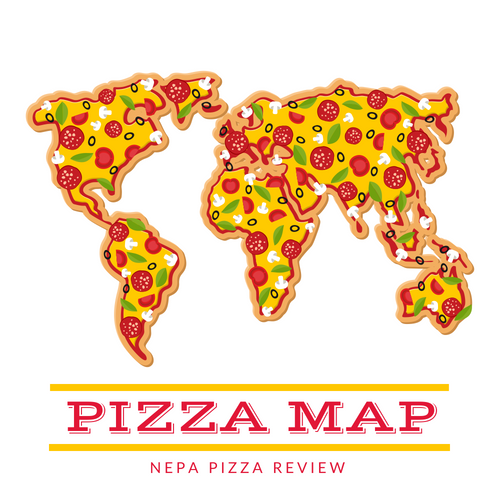 "They also have my favorite feature in a pizzeria - an open kitchen where you can see the pies being made." Thank you! This is a feature overlooked by many pizzerias here...and something I wasn't used to. There was a place over here called Paragan's pizza and when I first moved here I went to pick up some pizza there and all there was was a register and a room in the back that you couldn't see into. I'm from Long Island and every single pizzeria over there has the pizza guy out in the open tossing a pizza dough, spreading the sauce, cheese, etc. and popping it into the oven. They also all have glass display cases with several 'slice pies' to browse. This is what I'm used to so I'm happy when i find pizzerias over here that are like that. All in all though, I don't care as long as the pizza tastes good. Taste above everything.